While Thailand has struggled toward a much-delayed election, it finally looks like the vote is going to happen on March 24. The country’s election commission announced the March 24 date earlier this week, after the king promulgated a royal decree for the election to occur. Whether the election will be free and fair, and will result in any real progress putting Thailand back on the road to pluralist democracy, is unclear—and there is not a ton of reason for optimism. Although there is some possibility that a relatively free vote could be held on Election Day, and real progress could be made toward a return to democracy, there are many obstacles in that path. As Human Rights Watch has noted, the Thai authorities have utilized “unrelenting repression” against activists, dissidents, pro-democracy campaigners, and others in civil society in the run-up to the election. The constitution passed during this period of military rule further places massive obstacles to real pluralist democracy, and sets the stage for the army to continue to wield power behind the scenes for decades, and for Thailand to be “led” by a weak parliament. Meanwhile, the king has increased his power substantially in the two-plus years since the death of his father—a further roadblock that could prevent transparency and plural democracy. Although theoretically a constitutional monarch, he has gained complete control of the Crown Property Bureau (CPB); Forbes has written that the CPB holds assets worth as much as $30 billion, including prime real estate in downtown Bangkok. The king’s control over the military is growing as well; together, these trends clearly belie the idea that he is a constitutional monarch. Now, in the run-up to the vote, another one of Thailand’s serious challenges is coming to the fore again. After a period of (relative) quiet in Thailand’s southernmost provinces in recent years—“relative” in an area where there is still an ongoing insurgency and seven thousand people have died in the past two decades—violence is flaring up again. Deep South Watch, a group that monitors the conflict, said that the death toll in the southernmost provinces in 2017 was its lowest in fourteen years, for instance, and levels of violence were relatively low through most of 2018 too. Last week, attackers killed two Buddhist monks at a temple in southern Thailand. It was the first time a monk had been attacked in the south since 2015. 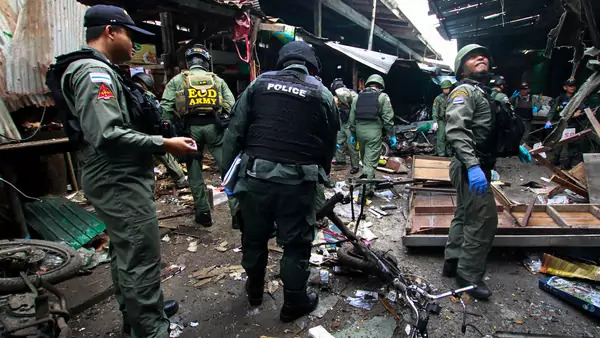 On the same day last week, someone launched multiple bombings against security forces in the south, and Thai authorities shot dead an insurgent in a different firefight. In addition, the insurgents, who are believed to operate in diffuse cells without any clear sole leader, released a statement in early January encouraging fighters—and their supporters—to continue to battle the Thai state. As usual in the southernmost provinces, determining the exact causes of why violence ebbs and flows is difficult, given the opaque leadership structure of the insurgency and, often, the lack of reliable information about its operations. As Sunai Phasuk of Human Rights Watch told Al Jazeera, the insurgents may have launched this recent wave of attacks partly as retribution for the “recent assassination,” in early January, of an man alleged by the Thai government to be an insurgency leader, who was killed by gunmen in the south while he was riding his motorcycle. The man killed, Doloh Sarai, also was a Muslim cleric. But beyond the possible immediate retribution, the insurgency drags on, and may be accelerating, in part due to a lack of clear policy toward the south by the military. While the civilian government that ran Thailand between 2011 and 2014, before the 2014 military coup, attempted to make progress in negotiations with the insurgents—and seemed ready to possibly offer a higher degree of autonomy to the southernmost provinces—since the coup any movement on the situation in the south has stalled. The junta government still holds some talks with some representatives of the insurgency, although key leaders from the core faction of the insurgency have refused the junta’s pressure to join the talks. Insurgents may be realizing that the military is digging in for good—and will likely be in charge even after elections—and ramping up their attacks in response, hoping to convince the armed forces that doing nothing about the south will have consequences for the Royal Thai Army and the country generally. Overall, the combination of an election that could fail to move Thailand back toward pluralist democracy, the possibility of an angry reaction by many Thais if the election leaves the political calculus unchanged, and the revival of violence in the south make for a potentially grim 2019 for the kingdom.